Olivia: It takes a tree a century to do what this darkness does to me in one night. 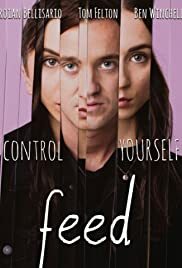 Although an eating disorder comes into play as the sister tries to quickly join her twin brother I'm not sure if that is the main focus of this story. It seems that anxiety disorder, depression, hallucinations, schizophrenia, and even a possibility of a brain injury from her car accident created this alternate reality that we experience throughout the story. Very well acted, and of course the writers had to leave a "you decide the ending" ending.